Increased success rates are just one of the benefits of single-embryo transfer. For many women coping with fertility issues, in vitro fertilization (IVF) is an effective way to increase their chances of becoming pregnant. But, as with any form of assisted reproductive technology, there are difficult choices to be made, including one of the most important: How many embryos should be transferred? Historically, the common goal for in vitro fertilization, dating back to the late 1970s, was and still is "one embryo – one baby," states Dr. Ronald F. Feinberg, M.D., Ph.D, the IVF medical director at Reproductive Associates of Delaware. In the early days of in vitro fertilization, the option of transferring more than one embryo didn't exist because just one egg was typically retrieved during a natural menstrual cycle. But multiple embryo transfer became the norm when IVF was initiated in the United States. "It was believed that success rates could be increased by stimulating the ovaries with hormonal medications (called gonadotropins) to yield more than one egg and embryo," he says. This "more is better" approach was complicated by the fact that freezing embryos was not yet possible, which led to the transfer of multiple embryos and increased the potential for a high-risk multiple pregnancy. Dr. Feinberg points out that many fertility clinics in the United States still routinely transfer two to three embryos despite not reporting "high overall success rates." The driving factor behind transferring multiple embryos to the uterus was – and still is – the hope that at least one embryo will "stick." Other reasons patients may opt for multiple embryo transfer, adds Dr. Feinberg, include the overall high cost of in vitro fertilization—with many insurance companies refusing to provide coverage for the procedure—and people who want to increase their chances of having twins. Recently, there's been a stronger push for single-embryo transfers, due to higher success rates, lower risk of health concerns for both moms and babies, and lower cost single-embryo transfer IVF procedures. 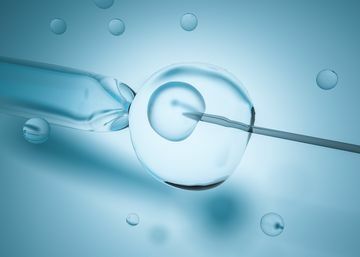 In their report "Elective Single-Embryo Transfer," published in April 2012, the Practice Committees for the Society for Assisted Reproductive Technology and the American Society for Reproductive Medicine recommend that elective single-embryo transfer [eSET] "should be offered to patients with a good prognosis," including donor egg recipients, in order to reduce the adverse effects of a multiple pregnancy on the mother and children. Some of these effects include extended medical treatments for both mother and baby and pregnancy-related diseases such as diabetes. So why should patients and their partners have more confidence in single-embryo transfers? For one thing, it works, says Dr. Feinberg, whose medical center was recently cited in Forbes as having the highest rate of single-embryo transfers in the U.S. In a recent news release titled "Increased Success and Safety in Assisted Reproductive Technology (ART) by Using Elective Single Embryo Transfer," the American College of Obstetricians and Gynecologists (ACOG) shares that "several studies demonstrate eSET achieves high rates of pregnancy, while simultaneously contributing to a drastic reduction in multifetal pregnancy. Already, we have begun to see the positive effects of these strategies. In 2009 approximately 50 percent of ART infants were from multifetal pregnancies, but by 2014, 78 percent of ART infants were single fetuses." One of the reasons for this high percentage increase, ACOG points out, is that more doctors are offering single-embryo transfer as a viable option, and more patients are choosing it. "I believe that single embryo transfers will become the norm going forward, particularly as our ability to select the healthiest embryos in advance becomes more commonplace," says Dr. Feinberg. "As with chromosomal testing, other diagnostic criteria to select implantation-competent embryos will be utilized to increase success rates and confidence in single embryo transfer." As you start to look into treatment options, it's important to be aware of all the pros and cons associated with single-embryo transfer so that you and your medical team can make an informed decision about your IVF journey.